Solheim, a former Norwegian diplomat, politician and environment minister, announced on the UN Environment Program’s website that he quit on Thursday, after he had received the final report on the audit of his official travel by the UN’s internal watchdog. The audit said that Solheim was a ‘reputation risk’ for the UN and also said that he had ‘no regard for abiding by the set regulations and rules’. Other damning statements to come out of the audit include the fact that Solheim did not properly account for some of his trips abroad and even let staff work in Europe rather than Kenya. Now they might care to turn their attention to the thousands of climate scientists, climate bureaucrats and green activists who also regularly jet around the world, whilst preening their green credentials. Just like the EU, the UN is run by an unelected, incompetent and corrupt set of bureaucrats. We ordinary citizens have no power to remove these oligarchs. Yeah, but you got to admit it is (was) a nice job. Not sure why I never get ’em. Forget the hypocrisy really, it’s government work, it’s always hypocritical. I shouldn’t worry overly about the unelected bit either to be honest. Can you tell me any elected ones that shine out for probity or even, heaven forbid, rationality and intellectual capability. I don’t worry about them not being elected. It’s not being accountable that really offends. The remarkable aspect is that this is the head honcho being held accountable, so some upside at least. That said, his real offence wasn’t his views (right on there) but being caught out enjoying his expensive perks so embarrassingly that he had to go. People might start to suspect similar behaviour from other senior officials, and that can’t possibly be, can it? It is not as if the UK has a functioning democracy. If you are a conservative you have no party to represent you. And once they have told a pack of lies during an election campaign – when called to task on this one Labour MP shrugged it off as just ‘campaigning’ – and are safely in place they can just show you two fingers with impunity. We need the Harrogate Agenda and right of recall. While you are writing about UN and EU incompetents do you or anyone else know who or what is the composition of the ‘Establishment” who seem to be the ruination of this country? 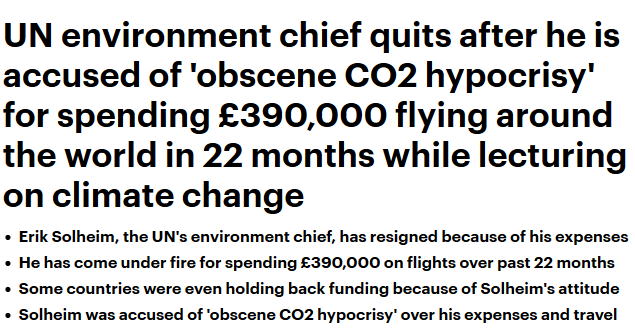 …The United Nation’s environment chief has resigned after being accused of ‘obscene CO2 hypocrisy’ for the expenses he claimed while flying around the world to give lectures on climate change…. Everyone knows that Climate Change jobs are a license to swan around the world holding expensive parties. How else are they going to spend the trillions of dollars which keep coming in? I suspect that there is something deeper behind this. Perhaps Solheim wasn’t spending enough? This ‘Resigning after Obscene Hypocrisy’ – will it ever catch on as a new strategy among the publicly funded??!! Hows about publicly “negotiating Brexit” while all the time being a dyed in the wool Remainer? Yes Theresa, I am thinking about you! Yesterday, in answer to a Corbyn question May used her new threat that if the zombie deal is rejected there might be no exit. Then a little bit later in response to Esther McVey’s question of if we will definitely be free on the EU at 11.01 on 30 March 2019, May said ‘Yes’. And they wonder why they are not trusted. We’re never really getting out, I think that much has been evident for some time. Warmists are amazingly unconcerned about their own CO2 footprints. They strongly resist the idea that they should unilaterally cut their emissions while there are Westerners resisting the CAGW message. What sickens is that much of this jet setting about would have been aimed at persuading developing countries not to use cheap, reliable fossil fuels, even at the expense of not deveolping as fast as they could. All ‘green’ politicians who drive SUVs should be outed. Any who drive a fossil-fueled vehicle should be outed. And why not go further and vilify them if their electricity used for charging is not renewable even if they have a battery car. Why stop there? Do they use the benefits of fossil fuels in their homes or are they totally off the grid? Further, do they use computers, washers, dryers, etc which use fossil fuels in the manufacture and plastics in their construction? Anyone who thought the UN climate alarm crew were a bunch of phonies is not going to be dissuaded by this. And yet the ‘scandal’ to hit the news today is that the woman who founded Bet365.com paid herself £267 Million this year. Around half of that would be handed straight to HM Customs and Excise in the form of income tax, and it’s probably a damn site more than Google, Amazon and Starbucks collectively paid this year. I might add, that £267 Million has come from the pockets of hard working individuals who have already paid tax on it. Double Bubble for the tax man. Whilst waste and unnecessary spending by civil servants is tolerated by the British public because it’s ‘for the country’ the moment anyone actually works for, and earns the money they deserve, they are the ones vilified. I suspect her package is a bit more tax efficient than you envisage Hottie! Anyway, how did a WOMAN become the top paid boss in a world awash with sexism and misogyny and discrimination? Had that been the case the MSM would be screaming it from the rooftops. On your second point, I agree 100%. The glass ceiling didn’t seem to bother her. Her company Bet365 is domiciled in Gibralter, so not sure how much tax it pays. I expect she receives most of her income ‘abroad’ and not as taxable salary (capital gains, options, share grants that can then be sold abroad?) so doubt she’s paying income tax on even half her remuneration.